We have only one twin room here at Warkworth Guest House which is the perfect size room for two guests to share. 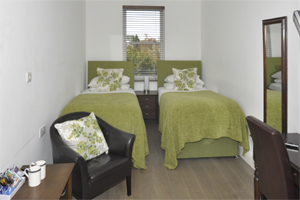 If you are looking to explore the city and need somewhere to rest then our twin room is perfect for you and a friend or partner. With light decoration and all the essentials provided you can really make your stay one to remember and pleasurable. Our twin room includes all the tea and coffee making facilities you will need, flat screen television with Freeview access, free WiFi and extra bedding should it be required. Our prices start from £95 a night.